Tustin, CA, 2016-Nov-22 — /EPR Network/ — Epinex Diagnostics, Inc., a Tustin, California USA based biomedical company, commemorates National Diabetes Month by launching the “Am I Diabetic” mobile phone app for iPhone and Android devices. 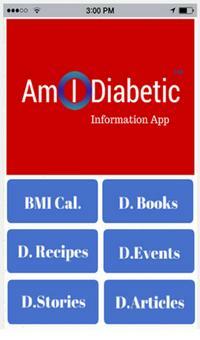 The function of this app is to provide educational information and awareness about diabetes. With over half a billion people around the world suffering from diabetes and millions more at risk, digital health platforms such as Am I Diabetic have the potential to provide unprecedented access to diabetes education. This informational app features a BMI calculator and a diabetes risk test. The BMI (Basal Metabolic Index) is a crucial measure of obesity and an elevated BMI is a major indicator of type 2 diabetes risk. The diabetes risk test evaluates the user’s likelihood to develop diabetes. The app also provides users with easy access to stress relieving exercises like yoga and meditation. In addition, this app comes with links to diabetes-friendly recipes, books, events and news as well as a map of diabetes prevalence around the world. These resources will allow users to conveniently learn about the disease and will help them to take preventive measures. Epinex plans to expand its use of the mobile digital health platform with its upcoming “MyG1A” app. This app will interface with the Epinex G1A Rapid Test for diabetes monitoring, which measures glycated albumin in a hand held device. This test is in the development phase and is intended to become a monthly point of care test for diabetes screening and management. Over a decade of research has shown that glycated albumin can be used as an effective monthly marker for diabetes management. Because albumin naturally replaces itself every 30 days, true diabetic status is reflected in an accurate measurement of the damage to albumin caused by diabetes. Epinex Diagnostics is a private medical company that develops innovative point-of-care diagnostic tests and strives to be at the forefront of new, cutting edge technology. Follow the company on Twitter and Facebook for the latest developments, watch the App Video and visit www.epinex.com for more information.